Super Savings Item! 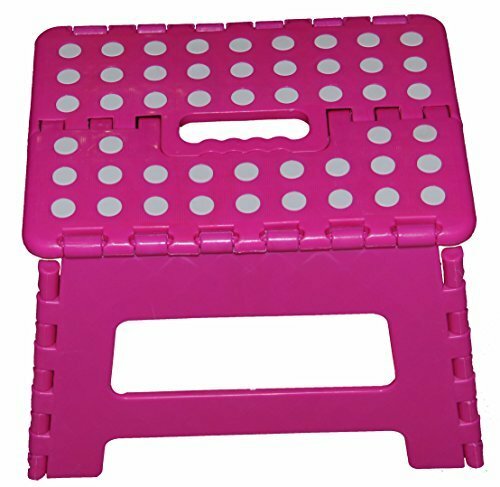 Save 32% on the 11'' Super Quality / Heavy Duty Folding Step Stool with handle, Non Slip for Adults and Kids, Saves Space, / Super Handy - Pink by Homeco Design at RVTE. MPN: unknown. Hurry! Limited time offer. Offer valid only while supplies last. This 11'' super strong folding step stool is made of heavy duty plastic construction for lasting durability which can carry up to 300 pound. This 11'' super strong folding step stool is made of heavy duty plastic construction for lasting durability which can carry up to 300 pound. Therefore, not only it is wonderful for kids, but it is great and ideal for adults too. It has a carrying handle, allowing you to carry it wherever you go. The stools surface has rubber polka dots preventing injuries which occur from slipping making it safe for kids. It has rubber polka dots on the stools surface top, preventing injuries which occur from slipping making it great and super safe for kids and adults alike. Made of heavy duty plastic construction for lasting durability, could hold up to 300 pounds. Foldable step stool has a carrying handle, allowing you to carry it wherever you want to go. Conserve space by simply pulling up the handles and pushing the sides in. If you have any questions about this product by Homeco Design, contact us by completing and submitting the form below. If you are looking for a specif part number, please include it with your message.